This extraordinary, almost abstract, male Kifwebe mask with cockscomb is painted with different shades of brown pigment paint. 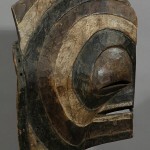 A square, protruding pout is typical for the masks of the Songye tribe. These are very powerful masks, the most powerful for this particular region and time. There are male – distinguished by the large crest on the top to the head, and there are female – distinguished by a smooth head. They are mostly reserved for the shaman or important elders of a tribe or village. 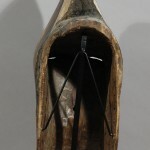 When an individual don the Kifwebe mask he does not embody the spirit of animal or nature – he is, quite simply “Kifwebe.” The masks are thought to ward off evil spirits and are highly prized and often passed down for generations. Kifwebe masks are differentiated by gender, shape and size but also by the basic surface coloration and the decorative design and patterns on the surface. The masks said to represent a female are rarer than masks supposed to depict a male. Normally a band of mask-wearers is made up of one female mask and a number of male masks. Male and female masks are all worn by men. Historically, the Luba Empire in Congo is said to have developed from a migration led by the Songye king Nkongolo. 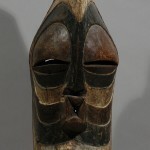 Both the Luba and the Songye tribe produced Kifwebe masks used in secret societies. 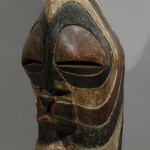 The kifwebe masks were believed to possess healing and mystical power for the benefit of social control and protection. The mask bearers were considered as visual manifestations of the law. They sustained the rules of the society. 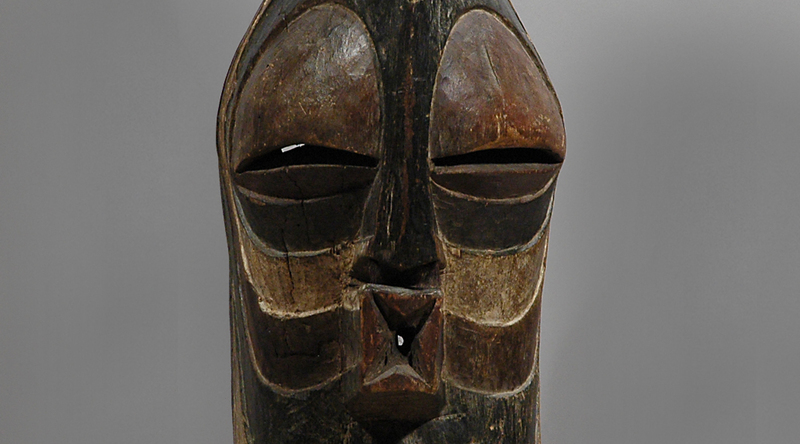 Kifwebe masks represent a supernatural being that defies any categorization. Not human, animal or spirit they are accompanied by strange sounds in the performing rituals. Typically, the holes you see to the bottom of the mask are filled with grasses and fibers to complete an entire-body costume.